While our museum houses some impressive and large artifacts, some of our exhibits are physically a part of the building itself. When you walk through the halls, you may notice some murals depicting different moments in the submarine force. These images are just as fascinating as the physical items stored around them. Over the next few months, we will look at these murals and the stories they tell. In the main walkway, is a black and white image of the USS Tunny (SSG-282.) The image shows the submarine launching a Regulus cruise missile, which was the precursor to the first generation of the Polaris missiles. USS Tunny was a Gato-class submarine and one of the first nuclear deterrent submarines that served in World War II and Vietnam. During her service, she received nine battle stars and two Presidential Unit Citations. Tunny’s adventure was not yet over. On April 11, Tunny sighted the Japanese submarine I-9 on the surface near Truk. Tunny fired her three remaining forward torpedoes at the I-9; however, the Japanese submarine maneuvered to avoid them and counter-fired. Two torpedoes narrowly missed Tunny. She was then unsuccessful in trying to maneuver to sink a Japanese destroyer with her last torpedoes. The Japanese destroyer attacked first, and Tunnywas pounded yet again by depth charges, sustaining minor damage. She then concluded her patrol at Midway, and would receive a Presidential Unit Citation for her second war patrol. Lieutenant Commander Scott was awarded a Navy Cross. Tunny continued her distinguished service after World War II. She was re-commissioned during the Korean War but did not serve there. Instead she was extensively modernized and converted to carry the Regulus land-attack surface-to-surface missile (with hangar for two missiles, and a launcher.) Tunny was re-designated as SSG-282. The drawback to the Regulus was that the submarine had to be surfaced to fire the missile. In 1966, Tunny was converted yet again into a troop-carrying submarine, with a deck shelter for small amphibious vehicles, and re-designated APSS-282. Tunny then conducted special operations and supported Marine amphibious operations along the coast of Vietnam. Tunny finally met her end as an exercise target, by a torpedo fired by the USS Volador(SS-490) in 1970. 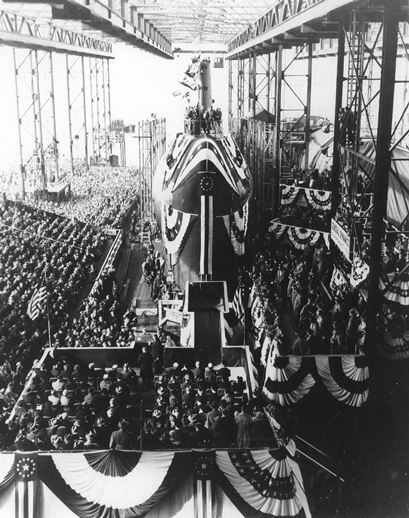 On January 21, 2954, Nautilus was launched changing the how the submarine force would operate forever. At 10:57am, she slipped into the waters of the Thames as the sun broke through the clouds of the early morning. Complied in the archives of President Eisenhower, is a brochure complied of that fateful day. 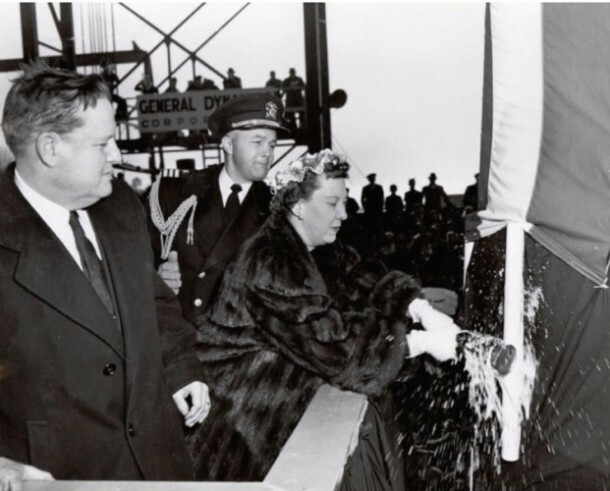 The brochure belonged to First Lady Mamie Eisenhower who served as the ship’s sponsor, breaking the bottle of champagne over its bow as it moved into the water. Within the program are paragraphs describing how historic Nautilus was.